Being Frugal and Making It Work: $1 + Free Shipping! Vibe Noise-Isolating Deep Bass Comfort Wear Earbuds With Case & 4 Extra Ear Gels! $1 + Free Shipping! 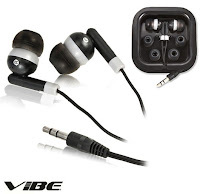 Vibe Noise-Isolating Deep Bass Comfort Wear Earbuds With Case & 4 Extra Ear Gels! 1SaleADay now has a flash sale every 30 minutes! Right now you can get Noise-Isolating Deep Bass Comfort Wear Earbuds for ONLY $1 and that includes FREE SHIPPING! Their $1 + FREE SHIPPING deals are always my favorites!